Mood board: Margaret Howell’s sartorial celebration of effortless tailoring is always a timeless affair, but this season it was her smart styling cues that stepped stealth essentials up a notch in the street cred stakes. 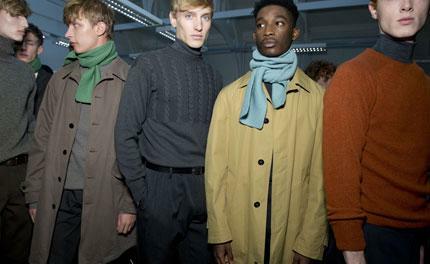 Introducing a three-step layering equation, fine gauge turtlenecks were tiered under crisp cotton shirting that was then capped off with another woollen sweater or a boxy, tweed jacket. Best in show: The Brit’s elegant colour palette of slate grey, taupe, camel and teal that nostalgically washed over trench coats and cable knitwear staples, reminding us of the English countryside under snow. Finishing touches: Howell’s aesthetic may be pared-back, but that doesn’t mean she’s uninterested in accessories. Subtle leather belts kept all in neat order upstairs, while coloured socks peeped out from A/W’s abbreviated trousers that were finished with a classic lace-up or a polished up, Dr Martens-style boot.